If you want to grow a flower garden that will supply you and your family with yummy food to eat, you’ve come to the right place. We’re going to show you how to grow some flowers that you can mix into salads, teas, lemonades, and even baked goods. Most of the flowers we’ll introduce you to can be cultivated easily in a home garden or indoor window garden. They don’t need a lot of care, they’re cheap to grow from seed, and they’ll give you colorful blooms that are nourishing and gorgeous to add to meals and drinks. Bachelor’s button is a flower that tastes a bit like cucumber, so it’s great for adding to salads or pasta dishes. It has a frilly texture, like radicchio, and it’s perfect for eating in its entirety (the bloom) or eating a petal or two. Plant bachelor’s button (an annual) in full sun and make sure it has moderate water. Sow seeds in spring (or in autumn if you’re in the desert) and you’ll have blue, pink, purple, or white blooms to use in your food the following season. For a mildly tangy flavor in tea, salads, and baked goodies like lemon cupcakes, add calendula. This flower is beautiful and flavorful. It has delicate and thin yellow petals (these are all you’ll want to eat) that add visual and palate appeal to dishes prepared for spring, summer, or fall. 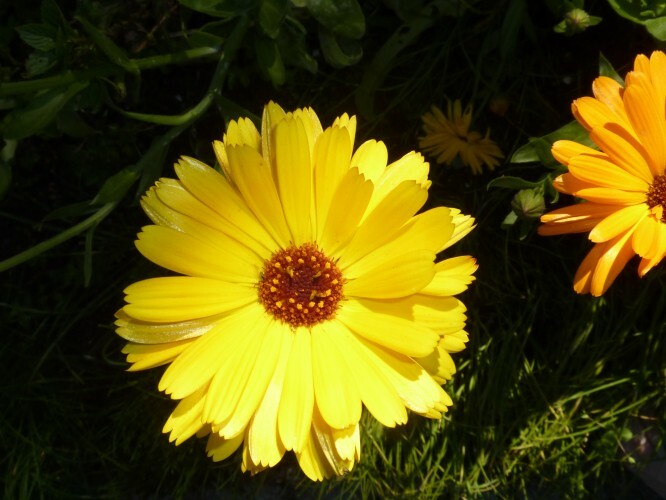 Grow calendula in full sun, offer it moderate water, and make sure it has soil with good drainage. Calendula flowers typically give color to a garden for a full season. Violas, including pansies, have a velvety texture that makes them ideal for using on fancy desserts like wedding cakes and holiday cheesecakes, and in decadent cocktails. These flowers are perennials, but they’re usually grown as annuals. They prefer full sun to partial shade, and they need regular water with well-drained soil. Violas grow in low, bushy plants and they come in solid colors or “whiskered” varieties. In addition to these flowers, you can grow carnations, nasturtiums, and herb flowers like lavender to add to food and beverages.